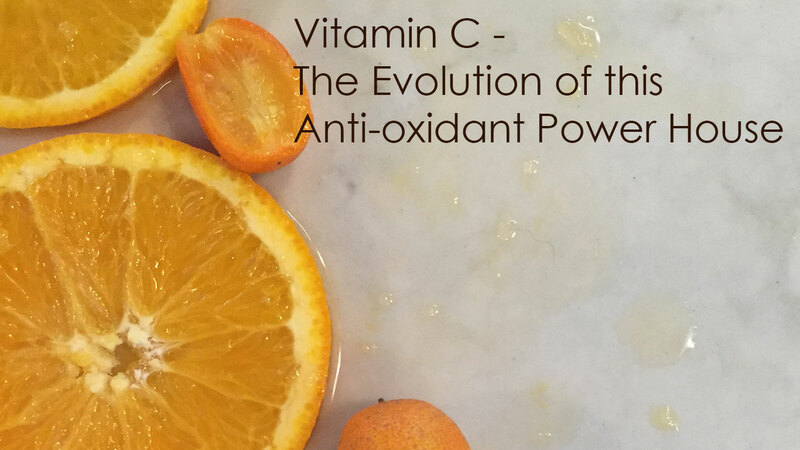 Vitamin C – The evolution of this anti-oxidant powerhouse. For most of us in the skin care industry, we know instinctively that one of the most important tools we can use to induce the “anti-aging” effect is topical Vitamin C. We have over 40 years of research and clinical validation to support the effect that L-Ascorbic Acid has on cutaneous tissue. Chronic extrinsic insults, exposure to ultra violet radiation and environmental toxins can exponentially increase the aging of the skin by destroying key proteins and increasing oxidative stress in the skin. These factors can lead to histological changes in the skin at the cellular level, in turn manifesting as poor laxity/tone, increased roughness, dullness, unwanted pigmentation, telangiectasia and classic rhytid formation. Repairing, preventing and even reversing this damage requires flooding the skin with a cascade of nutrients that are selectively taken up by the cells, allowing them to effectively neutralize the physiological processes that lead to tissue abnormalities. Vitamin C is by far one of the most beneficial and necessary actives to achieve this response, because it is one of the chief catalysts required for the formation of structural protein such as collagen. In addition, as a reactive oxygen species scavenger, it directly targets the heart of the cell, our mitochondria, putting a stop to unwanted electron transfer and free radical formation before it can damage our vital DNA strands. This is where it excels in remodeling photo-aged skin. Since humans lack the enzyme to create native Vitamin C, we must obtain it through diet. Due to poor absorption through the GI tract, the only way to reach desired efficacious levels in skin is through topical administration. And due to the fact that the level of Vitamin C in our skin drops 425% by the time we reach middle age, topical application becomes paramount to achieve the therapeutic physiological changes we desire. The problem we face in our industry is old, antiquated Vitamin C technology. Not much has been done to take the gold-standard, and bring it into the 21st century. That has all changed since the launch of our Catalyst family of products. A patented cocktail of L-Ascorbic Acid, amino acids such as L-Lysine, L-Proline and Glycine (the 3 major amino acids required for collagen formation), Zinc and Copper, collectively create a powerful tool for skin repair known as Zinc Finger Technology (ZFT). Zinc Fingers, essential constituents of proteins utilized by cells to turn genes on and off, afford us the ability to target and edit genetic text and repair damaged cellular DNA. Acting as a cellular “word processing” system, these Zinc Fingers attach to specific damaged sequences of DNA, cutting out these sections, quickly allowing the DNA to repair the broken strand. This widely used medical technology has never been applied to skin care, until Osmosis formulated the Catalyst collection, taking the standard Vitamin C serum to a new stratosphere. The level of correction seen with this family of products is unparalleled in the entire industry. In fact, a feat unto itself, we have finally received a grant on our patent that now allows us to “prevent skin cancer and treat skin lesions.” This has never been achieved in the cosmeceutical space, and we are proud to say we have the technology to rival every single competitor out there. From age reversal, wound repair, pigment reduction, skin tag removal, pre-cancer removal and everything in between, an abundant amount of evidence supports the usage of Catalyst, Catalyst+ and Catalyst AC-11. Osmosis has re-defined the gold-standard in Vitamin C technology, and now it’s your turn to reap the benefits from these supercharged anti-oxidant powerhouse serums. Enjoy!